If you have been diagnosed with advanced cancer, you need information to decide what treatment options are the most appropriate for your specific situation. One of the key pieces of information that you’ll want to factor into your decision is your prognosis (the predicted course of the disease). A recent study by researchers at the Center for Research on End-of-Life-Care at Weill-Cornell Medicine, however, found that only 5% of advanced cancer patients fully understood their prognosis and 38% had never even discussed their prognosis with their oncologist. 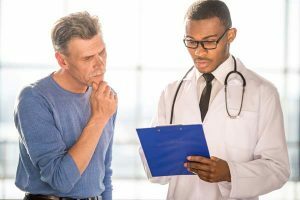 That lack of communication and information about your disease, prognosis, and how treatment would affect that prognosis makes it very difficult to make an informed treatment decision. To get the information you need to make an informed decision about advanced cancer treatment, it’s important to have an open dialogue with your oncologist. You should also consider seeking a second opinion on both your pathology and treatment recommendations to confirm or change your diagnosis and treatment options and lower the risk of misdiagnosis. What are my treatment options and how might they potentially affect my prognosis? There are standard therapies and newer therapies available for some cancers. Surgery might be an option before or after chemotherapy. Radiation may be another modality to consider. You should ask about each of these options and about options that might be available through a clinical trial. Is there anything I can do to improve my quality of life while undergoing treatment? Your physician can tell you if there are any lifestyle changes that may improve your prognosis or quality of life or if there are complementary or alternative approaches that might mitigate the side effects of treatment. If I chose to undergo treatment, what are the potential side effects and how long will recovery take? What you want to know is what impact treatment may have on your quality of life. For example, if the likelihood that another round of chemotherapy will be effective is low, are you willing to experience the side effects that the treatment may cause? Is it more important to you to feel well enough to spend time doing what you enjoy with friends and family? Are there treatment options that have fewer side effects you could consider, even if they are in the earlier stages of being evaluated for their effectiveness? If I decide not to undergo treatment, how will that affect my disease course and quality of life? Your oncologist can tell you what impact choosing not to undergo treatment may have on your life expectancy. He or she can also explain what types of symptoms you may experience as the disease progresses, how those symptoms can be managed in an effective way, and how they may impact your quality of life. In addition to understanding your prognosis, you may also want to consider what your goals and priorities are. Are there things you want or need to do? Once you understand your prognosis and treatment options, you’ll be better equipped to make an informed decision about your care.